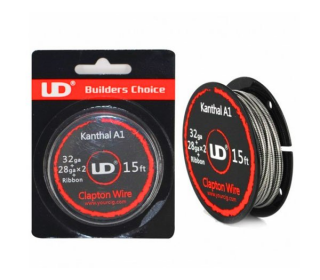 Clapton is a resistive wire with which you will make very low coil for a high power vape. The Ribbon Clapton is made of kanthal flat 0.5 mm wide on which are placed 2 wires of Kanthal A1 0.4 mm mounted in parallel, all surrounded by Kanthal A1 0.2 mm. The complexity of this structure makes it a very difficult handmade product. Clapton the coil will permit you extremely low coil. It ensures a very homogenous heating and a very fast cooling so it can be used at high power. The maximum heating temperature is 1400 ° C.
Some very experienced people make their own Clapton wire. This coil of 4.57 meters will save you tedious work requiring a lot of investment and time.